Physical therapists (PTs) perform a number of tasks intended to help clients regain strength and mobility after an accident or illness. They work in hospitals, homes, and other clinical environments according to a patient’s needs or capabilities. Physical therapy career opportunities are expected to grow at a much higher rate than the national average and their median salary is higher than the national average. A doctor of physical therapy degree and licensure are required to practice in most states in the U.S.
PTs can work in hospitals, nursing homes, clinics, private practice, or even make house calls. They work closely with clients on a one-on-one basis or sometimes oversee assistants who perform a number a tasks for them. Most PTs work work full time, standard business hours, but there may be some need to work evenings and weekends. is the average annual pay for physical therapists. have a Master’s degree while 37% have a Doctoral degree. Doctor of Physical Therapy (DPT) degrees are offered at more than 200 accredited institutions across the U.S. A bachelors degree and specific prerequisite courses are required for entry into most of these programs. This varies by school so check your programs website for specific requirements. All states require licensure, which varies by state, to practice, but all states require a passing score on the National Physical Therapy Examination. PTs work with patients who are recovering from injuries or illness to help them regain strength and/or mobility. 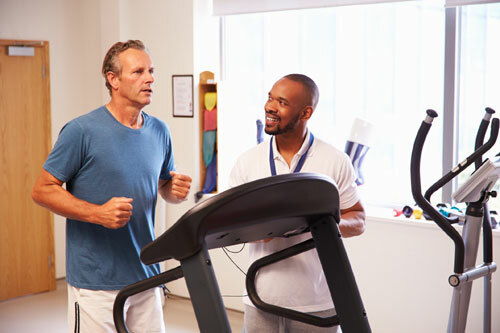 PTs assess clients, develop treatment plans, and assist individuals in performing various forms of exercise and stretching to help them reach their recovery goals. You might also be educating the client or their family on what to expect as the patient recovers. PTs typically earn between $57,060 and $119,790 with a median salary of $84,020 according to May 2015 BLS.gov statistics. PTs who work in home health are among the highest paid with an average salary of $94,400. Physical therapy is fast growing field with higher pay rate than average which makes it a competitive choice for many seeking a potential career choice. The PT profession is expected to experience around 34% growth over the next decade which is much higher than the national average for all jobs of about 7%. This is in part due to the aging of the baby boomer generation and the increase in chronic ailments such as diabetes and obesity. Outlook for jobs working with the elderly or in rural areas have a particularly good outlook.